A long drought of interesting movies comes to an abrupt end with the wide release of three films this weekend, all with aspirations of box-office glory and/or Oscar attention. Michael Douglas has his first starring role since last winter's critical and commercial success Traffic with Don't Say a Word, a psychological thriller in the literal sense of the term. 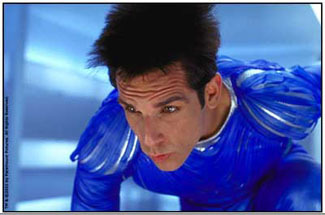 Ben Stiller directs and stars in Zoolander, a zany comedy about male models and international espionage. Hearts in Atlantis brings another of the "serious" King books to the screen, with Anthony Hopkins providing the acting chops and credibility. The favorite to win the weekend is Paramount's Zoolander, which launches in 2,507 venues. Ben Stiller's career has changed dramatically since his last directed film, The Cable Guy. In the five years since the film some blamed for nearly killing Jim Carrey's career, he has gone from comic character actor to box-office headliner. Both 1998's There's Something About Mary and last year's Meet the Parents were wildly successful, each grossing over $150 million, the latter holding the October opening record of $28.6 million. Zoolander clearly is looking to capitalize on both this success and the Austin Powers brand of comedy. Promotion for this film has been quite relentless, which should lead to a very successful opening. I predict a $17 million opening and the top spot at the box office. With creepily effective ads, Don't Say a Word hopes to capture the adult audience this weekend. Michael Douglas has had very good success with this type of thriller; with The Game in 1997 opening to $14.3 million and A Perfect Murder in 1998 opening to $16.6 million, establishing him with a small-but-determined base audience for this genre. The best lesson a Hollywood star can learn is to give his or her audience what they want; this appears not to be lost on Mr. Douglas. His star power is shouldering the bulk of the load for this film's success. Brittany Murphy also stars, playing the psychotic woman who Douglas has to interrogate to find the secret number in her head to give to kidnappers who have his daughter...excuse me, I need a breath there. Debuting in 2,802 venues, this film should open in the same range as the two thrillers mentioned above. A $14-15 million debut should be good enough for second place. Hearts in Atlantis joins The Shawshank Redemption and The Green Mile among the ranks of Stephen King's non-horror books brought to film. As with The Green Mile, this also contains some elements of the supernatural, with Anthony Hopkins taking the lead role as a stranger in 1960s Maine with mysterious powers. The Green Mile took in $18 million on opening on the strength of Tom Hanks; despite this year's Hannibal, Anthony Hopkins is no proven box-office performer. A more apt comparison from Hopkins' filmography would be Meet Joe Black, although most everyone hopes that a less-ponderous film will result from Scott Hicks of Shine fame. Warner Bros. is releasing this in 1,751 venues, which appears to be a "prestige" release pattern. They obviously hope to leave room for critical praise, which the studio hopes will come. In this medium-sized release, an opening of $8.5 million will provide a good base from which to build. The surprising legs of Hardball (only a 14% drop from first weekend to second weekend) will be tested this weekend, with some of its low drop-off likely being due to almost no alternatives last weekend. Since the film does have positive word-of-mouth, some legs are still likely to happen. A 33% drop would still be a very positive showing for Hardball. Similarly, The Others' 11% increase will not hold; it is finally seeing a weekend where its screen count holds steady rather than increasing, after a very successful run as the leggiest film so far this year. It may experience its most serious drop, over 30%. Launching in limited markets this week is Extreme Days, a road movie revolving around extreme sports. Getting pushed on MTV and other specialty channels, its 351 venues give it an outside chance of reaching the bottom of a weak top ten. A lot will depend on the behavior of the films about to exit the top ten box office.